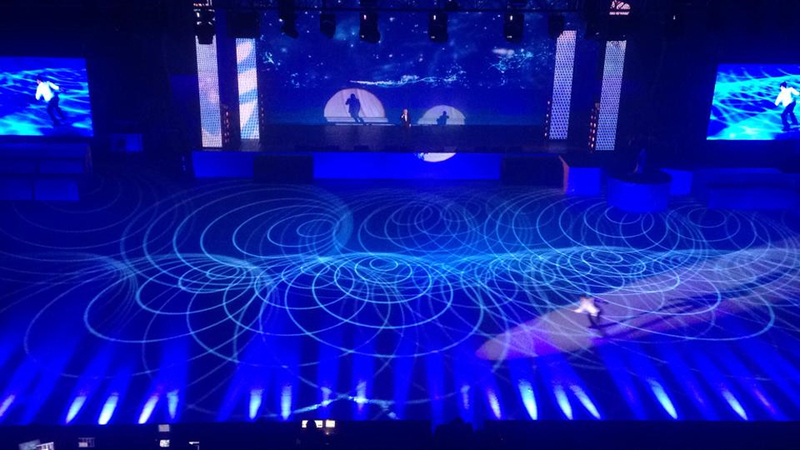 To celebrate the historic 2014 Paralympic Games, rental company Euroshow provided Martin lighting systems for a special program featuring an ice show at St. Petersburg, Russia’s Yubileny Sport Palace. The program was held before the final stage of the Torch Relay. Lighting designer, Alexey Yevstifeyev, who deployed Martin fixtures based on their functionality and brightness, proposed the lighting concept of the show to feature creative lighting and midair effects, consisting of 20 MAC Viper Profiles, 12 Atomic 3000 DMX, 20 RUSH MH3 Beams, 48 MAC 101s and 20 MAC 2000 Wash XB. The ice show took place at the Yubileny Sport Palace’s hockey rink with the main challenge being the limited time for installation. Taking this factor into consideration, Yevstifeyev used a combined truss mounting and floor mounting system. By placing the MAC 101 fixtures on the floor around the rink, he was able to create a beautiful display with compact and extremely fast LED wash lights, emphasizing the artist’s movements through the reflection effects. According to Yevstifeyev, ice shows are unique in that the ice surface, together with light projections, becomes an individual element of performance design. Yevstifeyev chose to deploy the MAC Viper to get the maximum out of the space he was given. Initially, the Martin RUSH Line had not been aimed at the rental market, but some fixtures have proven to be useful as they were for Euroshow. Bright beam shots by the MH 3 Beam added a great dynamic to the show and put the accents into the figure skaters’ performance with different styles and themes.